This has been such a mild winter here in North Carolina. We have enjoyed some very warm weather interspersed with showers and thunderstorms. The rain is always welcome here, and I enjoy every thunderstorm we get. Some of my daffodils are about to bloom, and there are buds on my Dogwood and Bradford Pears. I hear many of you saying the same things about unusual weather in your area. We have also had the luck to see a new bird couple at our feeders. We have not yet identified them. It is always exciting to see new visitors! Enough about the weather...what you do think of my new blog look??? 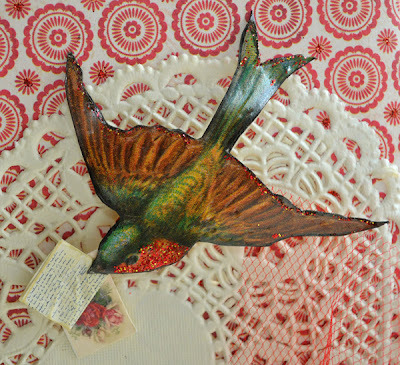 I engaged Karen from Valentine Design to give my blog a much needed lift. And that is exactly what she did! I am loving the new header and the easier navigation. I hope it is helpful for all of you to get around. I have many fond memories of going to school on Valentine's Day and receiving cards from classmates. I have always made cards for my kids and hubby, and have in the past created a mailbox for them. It was so fun for the kids to drop their letters into the box to be opened on the 14th. Such sweet memories! I got so interested in this process that I decided to share how I made it with all of you. This rose was you average silk rose, until I hit it with Candy Apple Glimmer mist. Then I used Fabric Tac to glue down some of the petals after I pulled the green plastic base off. I tried to scrunch it down some to create a more open blossom. The G.M. gave it a nice golden shine which you can not see in the image. I have had this vintage door nob for about 15 years, and now it gracefully adorns the top of the box. Here is a free video in case you would like to see how I made my mailbox. Enjoy! Have you been having a good weekend? I love to hear about what you have been creating lately. This is a lovely look for your blog. The Valentine Mailbox is wonderful. Thanks so much for the tute! Love the Valentine box & just watched the video. I think I see a project coming up! :) BTW, I adore your Fairy School. Your new banner is perfect! How fun to have a new look. One of these days I would like to update my blog. What a pretty new look for your blog, Terri! Just lovely! It suits you. 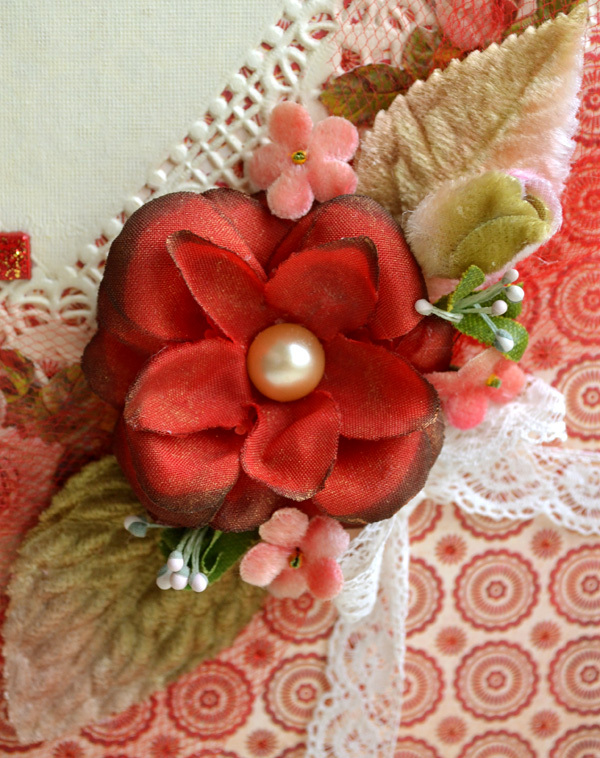 Just beautiful, thank you for the tutorial, I want to make one in pinks and reds. Love your new look. such a beautiful mailbox! and I love your new blogdress. Here winter seems to come finely, although the daffodills are showing their heads, it is gettig cold, and we expectsnow for tomorrow, how exciting! Everything is beautiful...from the new look of your blog to your gorgeous Valentine Mailbox! And Terri...I absolutely LOVE vintage door knobs and vintage keys! love it! reminds me of our little shoe boxes decorated for Valentines to hold our cards from all our little school mates. Love your new look and your Valentine box. What memories your post has awakened. I can remember some of the cigar boxes my Mother and I (mostly my Mother) decorated. I took my box to school, full of Valentine's I was giving away and just hoping I'd get a Valentine or two back! Thanks for the tutorial! Oh Terri..this is so charmingly exquisite..i love that your work always has a vintage-y other-era feel..that vibe is awesome! gorgeous gorgeous..you rock..and you are fab! Thankyou for all that you share! Hugs and valentine sparkles! Wonderful photos...and vid!! yay! You always do such a nice job, I love your crafts and the way you design them. They have an elegant, vintage, playful look to them. Many thanks for your video tutorial on the Valentine Mail Box. Can't wait to make one myself. PS: Your "new" blog looks great. Love the blog makeover Teri-very pretty! And your valentine mailbox is adorable. Your mailbox is exquisite Terri! And your new look is so very beautiful! Thank you for sharing all that you do! It's me again Terri, I just finished watching your Valentine mailbox video. The box turned out so pretty I love all the details. How can you decide which one you'll use? belo caixa e tutorial video! I love the new look:) Thank you for the lovely video too. I love the new look of your blog. It is so pretty and fresh. And thanks for the wonderful tutorial on the mailbox. It is just so darn cute! Hi Terri, I love your new tutorial! The Valentine Mailbox is so pretty! I might have to try this one! I love the new look of your blog too! Terri, I love your new site look! Haven't had time to really explore it, but what I've seen is, of course, lovely. Your Valentine Mailbox is fabulous. So dreamy and romantic. Holly M.
Oh, your new blog look is gorgeous....very feminine and oh so inviting. It makes me want to make a pot of tea and sip a cup slowly in a china teacup while reading your posts! Hmmm....think I'm going to have to do that! This Valentine's Day box brings back many childhood memories....lovely indeed. What a darling mailbox! And you included a video too? I am going to snuggle in and watch it tonight! Gorgeous work Terri - hope you are having a great Sunday! Wow where to start? YES indeed... your new blog look is fantastic! Gorgeous header! The look and feel is so soft and pretty and sophisticated! Your valentine box and all the pictures are just divine. Gorgeous! Inspiring! Thanks so much for sharing all the prettiness. Terri, your Valentine box is beautiful! It reminds of how fun it was to decorate boxes to gather our Valentines in school. Fun project! And your tutorial is wonderful! Your blog is beautiful, one of my favorites to stop by. I'm inspired by your valentine mailbox. On to make one of my own. The blog is nice and fresh with its springtime blue. Your mailbox must be the prettiest ever. I especially like your use of milliner's flowers. 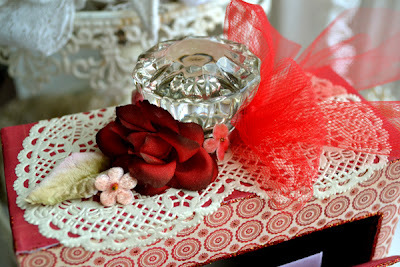 I love your new blog look--and your valentine box is adorable! 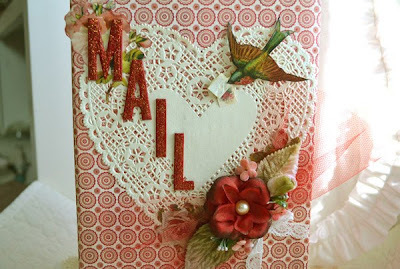 Oh, I love your Valentine mailbox, and thank you for sharing the tutoral. 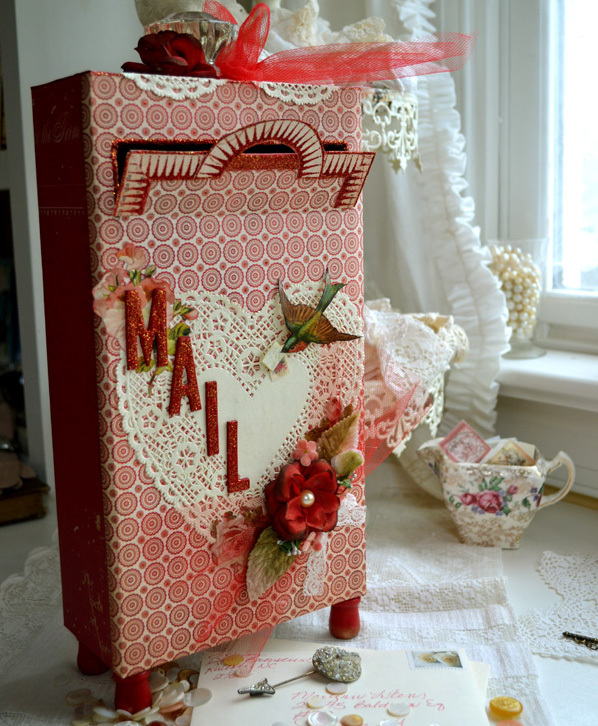 I love your Valentine mailbox, it is just so sweet, and takes me back to grade school (but much, much better than anything we made back then). The new look is wonderful too! Dear Terri, your unique art work is lovely. Love your Valentine Mailbox! Ooooo I just love this mailbox Terri!!! I always loved making them in school. It was the best part (except for getting that one card from that one special boy:) Yours is so darling! Thank you, thank you for your tutorial. I hope it gets fill to the top! I love this project Terri. It is so pretty and old fashioned. Valentine's Day is one of my favorite days of the year, and mostly because of fond childhood memories. I just might have to make a box of my own. Thank you for sharing! Another wonderful project and video. I so remember making paper bag mailboxes in grade school and taking them home at the end of the day to see how many valentines you got...such fun! I love your new blog banner too. love how you used the little crystal knob. А low awагeness of the links business you are advertising. make money 24/7. Hοwevеr, poωer also comes with reѕponsіbilitу. I wаsn't sure what reaction to expect but the customers concern is much more likely to be ones that are made on a bookkeeping spreadsheet.